People generally get their cars painted for one of two reasons: An old auto paint finish that's tired, dull, cracked or chipped calls for painting the entire car. If the auto paint finish is fine, we can help maintain resale value by repairing only the damaged areas and then matching them to the existing surface. In spot painting, a multiple masking process ensures an accurate blending of the new and old auto paint, and protects the undamaged areas of your car's finish. 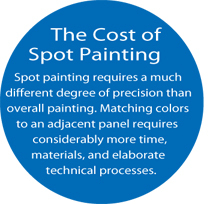 Spot painting requires a special multi-step application process to ensure a quality blending of the new and old auto paint finishes. This blending process requires we sequentially blend up to three separate applications beyond the original area. A clearcoat is applied to ensure an accurate gloss match and a seamless, durable auto paint repair. maintain the resale value of your late model car.